My friends Nana and Justin have been living and blogging abroad for the last few years. They’ve been a generous source of awesome foreign candy. 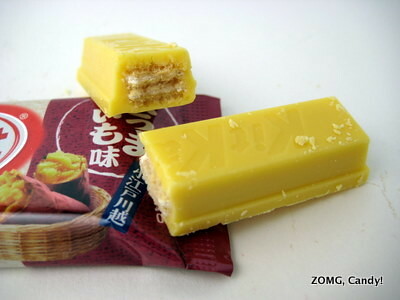 Their latest gift was several Japanese Kit Kats in Wasabi and Sweet Potato flavor. I’ll cover Kit Kat Sweet Potato today; Wasabi will be reviewed on Friday. And stay tuned for giveaway news, as Nana and Justin sent me more than I could ever eat! I love how the tear-away notch on the right of the wrapper is mirrored by an extra triangle on the left. Each individually wrapped package had two prettily pale yellow fingers that had to be characteristically snapped apart. I was both excited and nervous about trying these. Excited because I love sweet potatoes in just about any form (steamed, roasted, french fried, etc). Nervous because the sweet potato and sesame version that I tried a couple of years ago wasn’t great, though that also didn’t taste much like sweet potato. Lack of sweet potato flavor was definitely not an issue with this Kit Kat. The flavor was totally spot on – starchy and sweet, with some root vegetable earthiness. It tasted just like a real sweet potato. Unfortunately, though the flavor was exact, it was really off-putting when combined with the dairy, buttery creaminess of the Kit Kat chocolate. I got totally weirded out and couldn’t handle it. A —. Come back Friday for the wasabi-flavored Kit Kat review and details on how you can try to win some Japanese Kit Kats for yourself! And you can find Nana and Justin’s take on their website.